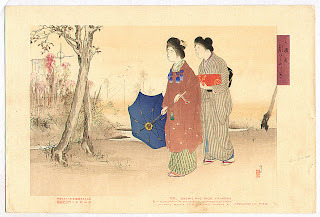 how do you see these woodblock prints, particularly when compared with the others i've posted (and i have posted the work of this artist before), or that you've seen elsewhere? it's not an original question, i know, but i'll ask it anyway-- is art made for hire by a department store or bicycle manufacturer, less art than what's made for a samurai or king, or from one's heart? i just realized what the question also is: do the japonese see these woodblock prints differently, knowing they were commissioned for trade? 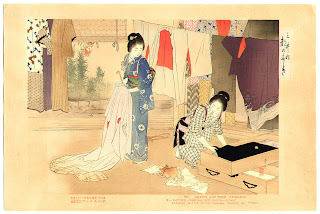 Woodblock prints were always made for trade in one sense. they were a cheep comoditiy for city dwellers with a bit of spare cash. The fashion aspect has always been one of the most important parts too. also, from references I've read it is not uncommon for Japanese department stores to stage exhibtions and promote the arts. I think the Japanese poetic sensiblity always manages to remain, with great individual artists standing out over time.